Is it ready for No. 61,000 yet? 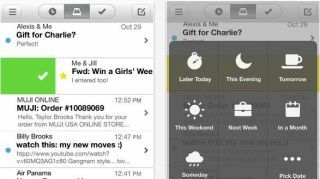 Mailbox, the third-party Gmail app for the iPhone made by Orchestra, is up and running. The only problem is, you'll have to wait your turn to download it. "Currently filling reservations on a first-come, first-serve basis," an all-caps message on the App Store read. Only users who reserved their spot by signing up in advance are gaining first access. That's not to say you can't get a reservation - you just have to wait behind a few hundred thousand people. The Mailbox team noted on their website that reservations will fill slowly to start in order to make sure all the cloud-based systems can handle the user load, but over time the numbers will pick up. Users can track where they are in line using a real-time ticker (available upon install) that counts down how many people are in front of them and how many people behind. TechRadar has a reservation - we only have 296,440 people ahead of us. The numbers are stacking up quickly on our tail, signaling demand is still boisterous for the app that promises to help users "fly" through their email thanks to a redesigned inbox. We signed up to receive a push notification in our Gmail when our turn is up, but for now it's fun to know we're no longer anchoring the end. According to the company's site, the service checks emails in the cloud before securely depositing them in your mailbox. It's all about getting down to zero - read and respond to what's important, trash what's not, and keep your inbox light and clutter-free. As for the app's nitty gritty, it relies on simple gestures and better organization to put an email service to the most task-efficient use. Users can single-swipe a message to archive or trash it. The app organizes conversations in a chat-like fashion for more coherent reading. Who waited so long to reply? Mailbox also snoozes emails for later using a button tap, sending stuff you don't want to read immediately back to the inbox to deal with tonight, tomorrow, or whenever. Plus, Mailbox can provide push notifications for new emails. It's free too, so there's no risk on your pocket book for the potential reward of gaining a better way to use your email. It's only running for Gmail at the moment, but Mailbox said other email platforms are coming soon. But keep an eye out for when you can get in line.